Here is my contribution to Rochelle’s Friday Fictioneers for this week, in which we get a photo prompt and then 100 words to write the story. This week’s photo was contributed by Madison Woods. 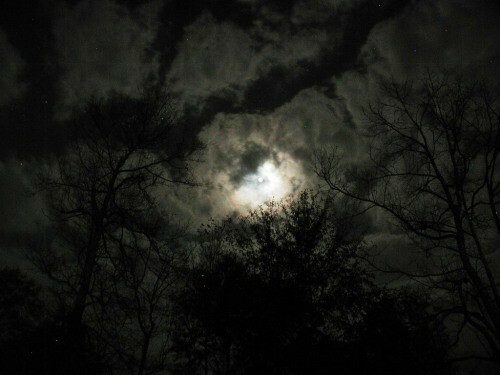 This week’s photo shows the moon high above. OR DOES IT? You’ll have to use your imagination to see what I first saw :-). It’s a new world, all right, thought Simon. He and Amy were the only two left; all the others had fled. “We should go too,” Amy said, shaking. “Go? Where?” was his reply. And so he and Amy stood staring down the smoky vegetation-lined shaft at the Earth’s burning core far below. Tapping the core for energy had seemed such a wonderful idea, but like a child playing with a chainsaw they had no idea of the power they were unleashing. Another hour, and the Earth would burn. Is going to live in the moon an option? Sometimes its scary to think of the fracking etc that goes on and the impact on the environment. One day living on the moon might become a necessity. Glad you liked it! We humans have so many “wonderful” ideas it worries me. Well done. What will we think of next? My money’s on “limitless energy via inter-dimensional bridge”. We must be careful how much we tamper with the earth. We’ve tampered with it enough already, for sure. Like fracking. What could POSSIBLY go wrong? What’s an earthquake or two between friends? Let’s try it on a fault line. I bet we could get loads of gas that way. I hope they get knocked unconscious or blow up really quick. Burning alive would be horrible. I hope so too. I think that close to the shaft it will be quick. There’s no point in running when the Earth’s about to end :-(. A limitless supply of molten iron and magma for everyone! YAY!!! Think of the fun we could have! What a dark reality to be faced with. A very grim but good take on the prompt! Thanks. It is a grim reality, with no way out for them :-(. Reminds me of Tea Leoni and Maximilian Schell waiting for the tidal wave in “Deep Impact”. He’s back to his disaster(ous) self. Well written my friend, but scary. Too close to reality. All the things being done to bring earth to iys knees. Well done. Let’s hope things don’t go quite this far. Thanks! I actually read the story yesterday already, but wanted to find a link for you, here: http://www.staufen.de/en/news/ — that’s not far from where I work. Not as dramatic and apocalypsy as your scarily good story, but one of the unexpected consequences of not thinking things through. Nicely topical. Great take on the photo. Thanks. Fracking is popping up everywhere. Let’s hope if they must continue they leave it at that and don’t go any deeper! Excuse the fact that I have a crazy weird memory, but is this the same Simon that was waiting for the solar flares to ruin the earth? But if it was, he doesn’t seem to have much luck, does he? A bit like Bruce in Die Hard. I quite liked that line too! Let’s hope it never comes to pass. They can indeed. A kind of “all or nothing” type of thing, maybe. It does sound violent, doesn’t it? And it was also the substitute swear word in the Battlestar Galactica reboot! What an imaginative take, Ali. I don’t want to be around when the earth burns. Yikes! I’ve see I’ve made it in to yet another story this week. 🙂 “Amy” is popular this week. Must be that moon or something. We’ll have a fusion reactor in a decade or so. Then you’ll really have clean, free energy. I saw this picture “inverted” too, but decided not to go there. I’m glad you did. You nailed it! This passage, “…like a child playing with a chainsaw…” is brilliant. Says it all! I just don’t get fracking or how this is a good idea. I hope we don’t come to the same end as those in your story. Fracking seems to me to be a panic reaction to the fact that we’re dragging our heels developing new forms of clean energy and therefore need to make gas last longer. This story was inspired by one of my favourite Dr Who stories – Inferno (Jon Pertwee, 1970). Where did the others go? I get a very Doctor Who feeling from this story…possibly because I’ve been watching so much of it lately. Either way, very well done. The scene was vividly painted in my mind. The others either reckon they can out-run the end of the world, or they’ve gone to spend their last hours with their families. Dr Who – “Inferno” (Jon Pertwee, 1970). One of my favourites, set in parallel realities where they’re drilling into the Earth’s core. One reality is several hours more advanced than the other and the Doctor gets to experience both. Watch it if you can find it! Oh I haven’t seen much of Jon Pertwee’s Doctor yet…I’ll definitely check it out! He was a great Doctor – some stories on other planets, some when he was exiled to Earth by the Time Lords (like this one). “Inferno” is a good one to start with. He was given some great stories to work with. Awesome. Can’t wait to see it for myself! So Earth is going out with a bang, not a whimper. Quicker, at least. Chilling story.